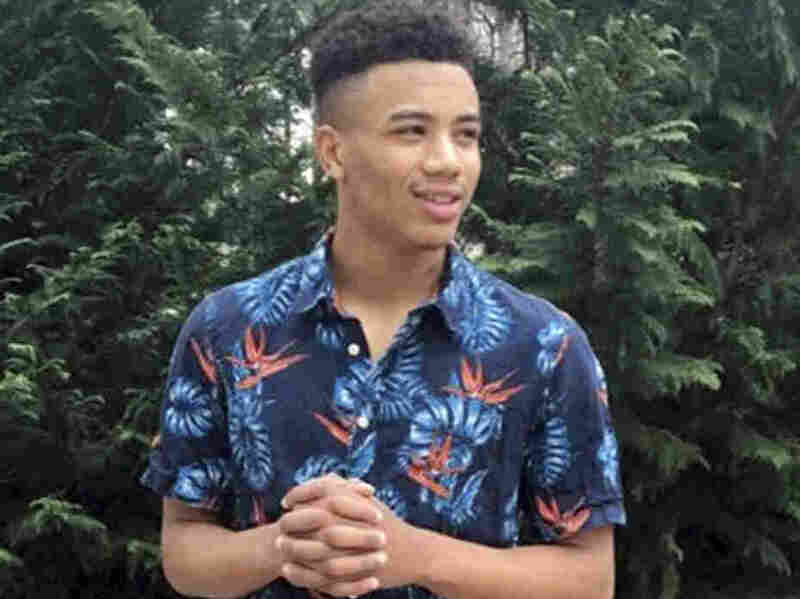 No Charges In Death Of Black Teenager Who Died After Being Chased By Police Anton Black's death was tragic, the state's attorney says, but it wasn't criminal. Police body-camera video shows a chase that ends in the 19-year-old unresponsive and not breathing. Anton Black's heart condition and mental illness were significant factors in his "sudden cardiac death" during a struggle with law enforcement officers on Maryland's Eastern Shore, according to an autopsy report. A state's attorney said Thursday that he will not not pursue criminal charges in the death of Anton Black, a 19-year-old Maryland man who died in September after a foot chase and struggle with police. The state's attorney also said he wouldn't ask a grand jury to investigate the case, despite the wishes of Black's family. Police in Greensboro, near the Eastern Shore of Maryland, approached Black on Sept. 15 in response to reports of a kidnapping. Black had been seen with a 12-year-old child, who family later said was a friend of Black's. Video released Thursday by the Greensboro Police Department and obtained by The Baltimore Sun, shows that when Officer Thomas Webster IV asked Black to put his hands behind him, Black took off running. The video shows the chase, struggle, and ultimately futile attempt by officers and emergency medical workers to save Black's life. Black's family says that his life should not have been put in danger in the first place. On Thursday, the Baltimore Sun editorial board said Black never should have been arrested. "Mr. Black ran for reasons that only he would know," the editorial board said. "Maybe he was scared of what would happen to him in a justice system that has failed African-American men more times than we can count." Further complicating the matter is that Webster, who tased Black and helped hold him down, has previously come under scrutiny for using excessive force. Webster was arrested in 2015 after a grand jury found it likely that he had committed a crime when, as an officer in Dover, Del., he kicked an unarmed man in the face. The victim was black. Court documents released in 2015 showed he had dozens of use-of-force reports in his personnel file. Webster was found not guilty of assault. Greensboro hired him last year to become the town's fourth police officer, over the protests of several Greensboro citizens who "worried about the message the town was sending to people, especially people of color," local media reported at the time. While Black's death is tragic, it wasn't criminal, said Caroline County State's Attorney Joe Riley. The state attorney's office "is not empowered to prosecute tragic acts," Riley said in a statement released Thursday. Riley cited the autopsy, which found Black suffered "sudden cardiac death" caused by a congenital heart defect. The medical examiner's report "does say that it is likely that the stress and the struggle with law enforcement in conjunction with his mental health status and his congenital heart defects contributed to his death." The report also makes it clear that Black was never choked, "physically struck" by the officers or "had force applied to his neck," Riley said. Webster was justified in arresting Black, Riley said. Webster stated that he had seen Black "dragging the younger male down the road," holding him in a "half nelson" and pinning him against the hood of a car. "On the body cam footage, the juvenile is clearly in distress and denies that Anton Black is his brother," Riley said in his press release. The Black family released the State Medical Examiner's autopsy Thursday, which documented at least 43 blunt trauma wounds across his body. The toxicology screen did not find any controlled dangerous substances, the family said in its statement. The state medical examiner's office, which ruled the death an accident, "lets the police off way too easy," the Sun wrote in its editorial. "Even without the meticulous cataloging of the 43 cuts, bruises and abrasions on Black's body that his family's attorneys compiled from the autopsy, we can say that had police done their jobs responsibly, he would be alive." In its statement, the Black family said there was no good reason for officers to use the degree of force they did: "There was no reason to tase him. There was no reason for the officer to tackle him, restrain him and shackle him. There was no reason to inflict 43 blunt trauma wounds on Anton Black. There was no reason for Anton Black to die." At a community meeting earlier this month, former Washington, D.C., police officer Trevor Hewick, who was working as a private investigator for the family, said that after examining the video, he had concluded that Black was killed with a chokehold. "I can stand here and tell you I am very confident in what happened to Anton," said Hewick, according to Maryland Matters. "They killed him and it's murder." "All right, listen, you're not his brother?" Webster asks. "No, I am," 19-year-old Black responds calmly. "He's not my brother, bro!" the young boy shouts. "Do me a favor," the officer says. "Put your hands behind your back." It's a late summer evening. The sun has just started to set, but the sky is still light. Black doesn't put his hands behind his back. He turns and starts jogging away from the officer. The officer gets into his car, and pursues. After a short drive, Webster exits his car and starts running after Black. "We're in foot pursuit of the black male," Webster tells dispatch, saying Black was "trying to abduct" the child whose name is redacted from the video. "I'm going to keep him in sight," the officer says, running after him down Maryland Route 313. Webster pulls out his baton and smashes the driver's side window. "Watch his hands!" another officer shouts. "Tase him! Tase him!" Webster fires the taser, which hits Black but doesn't subdue him. Black exits out the passenger door and tries to flee, only to be grabbed by another officer. Webster also grabs Black, who appears to bite an officer's hand. "He just bit me!" the officer says. Multiple officers hold Black against a wall, yelling that he is under arrest. They get him down on the ground. The first officer tells the other, "he's schizophrenic." Eventually multiple officers get Black to the ground, and are able to handcuff Black. "All right, roll over, chief." "He's schizophrenic, he's schizophrenic," the first officer says again. A woman opens her front door. "Anton!" she screams. The Baltimore Sun reports that it's Black's mother, Jennell Black. "What did he do?" she asks the officers. "He's having a problem," an officer responds. Finally they get him cuffed. "All right, everybody take a breather." The officer says: "Anton here tried to abduct a 12 year old, and then fled from the police." The situation appears to be under control. "We're good, we're good," the officer says. But Black is still struggling. "Anton, stop baby," his mother tells him. "Don't let 'em bully me!" Black seems to shout. It's hard to hear over the commotion. "I love you!" Black says. "Just relax pal," an officer says. "Just relax." Another officer tells Black not to fight. "You'll do better if you don't fight," he says. "Calm down. Calm down, okay?" "I'm getting old man, I couldn't keep up with him!" one officer says. "That was the longest foot chase I've had in a while," another responds. "This is a mental health emergency," Webster tells his mother. "We're not treating this like a crime. ... He's not with us right now. So he's gonna be okay. We're gonna get him some help." "Okay," his mother responds. She says she already had him evaluated, and he got let go last week. "They won't hold him long," an officer says. "He needs help." "So he's not going to be locked up?" she asks. No, the officers respond. They're going to take him to the hospital. They turn him to the side so he can breathe better. "He's breathing," one officer says. "And he's got a pulse." The first officer walks back to his car. He's away for just a moment. But when he returns, Black's mother is worried. "He's turning dark," she says. They start with chest compressions. The ambulance hasn't arrived yet. "Can you tell them to step it up," one officer says. They take Black's handcuffs off. They start what appears to be CPR. His mother is on the phone with someone. "Anton tried to abduct a kid, and police chasing him. He stopped breathing. Now. They got him at the front of my house, on the ground. He stopped breathing." His mother is still on the phone. Snippets of her conversation float over the scene. "Chokehold," she says. "Little kid." "Is he breathing?" his mother asks. "Come on, where's that ambulance at!" an officer says. His mother is sitting on the steps next to her door. Officers are cleaning up plastic bags, the detritus of medical equipment used to try to save Black's life. Someone says he lost his watch somewhere. "It's my grandfather's watch, man." "If you find a watch," he says. "It was my grandfather's watch." "So if you find something, please..."
"I'll make sure you get it," she says, seemingly distraught. She picks up a plastic bag and throws it in the trash bin. "I'm very sorry," the man says. "There was just nothing we could do. He was superhuman strength. I've never had to deal with anybody like that. It scared me, man." "Well, we're just doing the best we could," Webster says. "I'm sorry." "Did he start breathing?" his mother asks. "Not yet," the officer responds. "Not yet."